What Is The Difference Between LED and Laser Printing Technology? This blog will initiate you into the world of printers and cartridges. Here you will find recent news, announces, "how-to" articles, videos, as well as interesting and sometimes amazing facts about printing devices, printing technologies and printing supplies. All trademarks, trade names, service marks and logos mentioned on this blog belong to their respective owners. TonerCartridgeDepot.com is not responsible for any content published on this blog. There is never a day that passes by printer manufacturers release new model. Supporting this tradition, Ricoh introduced Aficio SP C400DN, a color laser printer for small businesses. Apart from “high-quality output”, “superior performance”, “high productivity” and other meaningless phrases, there is something else to know about this printing. When printer is turned on, it takes only 10 seconds to warm up for black & white prints, and 15 seconds for color. Should you assign the Aficio SP C400DN a large task, you will see it reaching printing speed of 26 pages per minute (ppm) in both color and monochrome. And the 600MHz controller helps output large files quickly. If you switch from the draft mode, it is possible to get 1200×1200 dpi resolution for the prints. It’s worth mentioning that a large printing task would be halted after 1,750 pages. This is the standard paper capacity of Aficio SP C400DN. However this figure can be increased by adding more paper drawers, which are not the only extension possible, by the way. This color laser printer is easily expandable with the Ricoh IS200e Image Scanner. 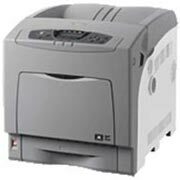 This adds multi-functionality to the printer and offers fast full-color and monochrome scan speeds and variety of “scan-to” capabilities. The printer sports an LCD operation panel on the front panel that provides simple access to menu functions and at-a-glance supply levels. WebImageMonitor tool allows users can view system status, check supply levels and change printer settings remotely from their PC. DataOverwriteSecurity System (DOSS) overwrites latent data information stored on the printer’s hard drive to prevent unauthorized access. So that you know, ‘N’ is printer model name stands for ‘network ready’ and means an Ethernet adapter is installed. The Aficio SP C400DN is priced $999. This entry was posted on Wednesday, December 19th, 2007 at 5:19 am	and is filed under laser, printer, Ricoh. "How to Detect and Fix Problems with Laser Monochrome Printing. Part 3"